How do I update the firmware on my DIR-857? How do I update the firmware on my DIR‑857? Step 3 – Click the “Tools” tab on the top menu, then “Firmware” on the left hand menu. 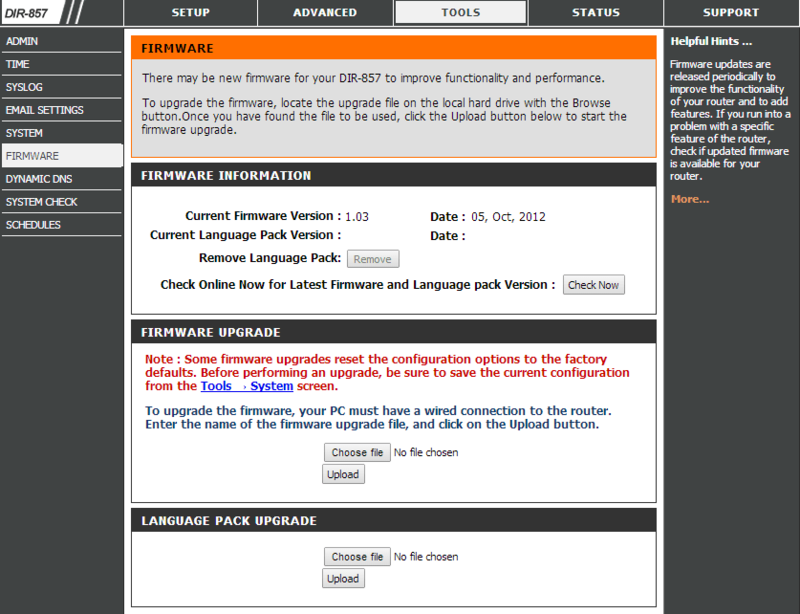 Step 4 – You can click “Check Now” to automatically check for a firmware upgrade. If you already have the file downloaded, click “Choose File” and select the firmware upgrade file. Click “Upload”. Step 5 – The firmware upgrade process will then start, this process can take up to 180 seconds. Once the router has finished rebooting, the router has finished upgrading and is ready for use. We suggest that when performing a firmware upgrade you are directly connected to the DIR-857 via an ethernet cable.